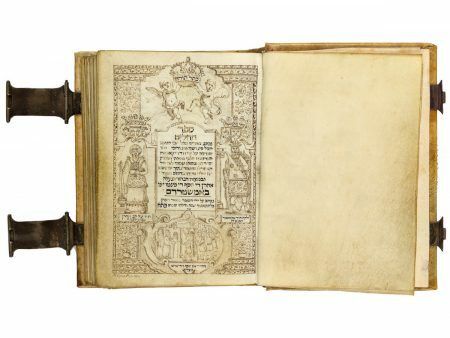 The manuscript has a decorated title page, one illustrated initial word panel, and two devices that imitate printed ornamental elements. All decorations, including the title page, were executed in brown ink similar to that of the text ink. The illustrated title page is signed by its artist: “Is. [hack] Siprut fec. [it], 1727.” Depicted on this page are David, the psalmist, and Aaron, clearly a reference to the first name of the patron. The name of the patron’s father, Joseph, explains the choice of bottom scene, in which the biblical Joseph is portrayed, most probably before his parents and brothers, pointing to the sheaves and stars of his dreams (Genesis 37:1–11). Also included are the crowns of the Torah (commonly associated with Moses, who does not, however, appear here), of priesthood (Aaron), and of kingship (David), taken from the Talmudic Sayings of the Fathers, 4:17.
selected literature Fuks 1987, p. 359, no. 456.